Every Tuesday at six in the morning, members of the San Jose-based Red Ladder Theatre Company meet at the San Jose Caltrain station to drive about 90 minutes Southeast to Soledad, Calif. They meet early to make sure they have enough time to get ready for a three-hour improvisation class they teach at Salinas Valley State Prison -- a maximum security facility where the state houses some of what it considers to be its most dangerous prisoners. Red Ladder has been working with disadvantaged communities in the Bay Area for more than 20 years. The theater company teaches improvisation techniques to help develop skills like problem solving and collaboration. The actors have worked in county jails and in juvenile hall, but they’re pretty new to maximum security prisons. Red Ladder actor Sarita Ocon says it’s not easy getting in and there are lots of hoops to jump. “After going through and hearing the kind of procedures in place I think I was feeling depressed,” Ocon says. 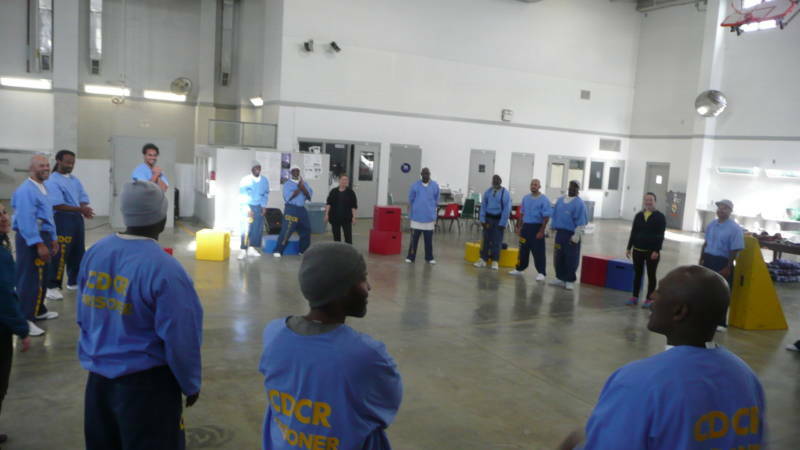 The California Department of Corrections requires contractors, like the members of Red Ladder, to carry identification cards, whistles and go through four days of eye-glazing power-point presentations on safety and regulation rules. And the company members are not getting rich from their efforts. They call their work a labor love; each actor gets $150 a day in fees. Once the prisoners are inside the drab, concrete gym where the class takes place, guards pat them down and check them in. And there’s also a sniper watching from an overhead gallery at all times during the class. “The juxtaposition of trying to have a free, open, creative environment when there's someone 15 feet above your head with a gun pointed at you for your own safety is something you need to acknowledge and be aware of and then also set aside when it comes to looking at the work and approaching the work,” says Altree Piemme. 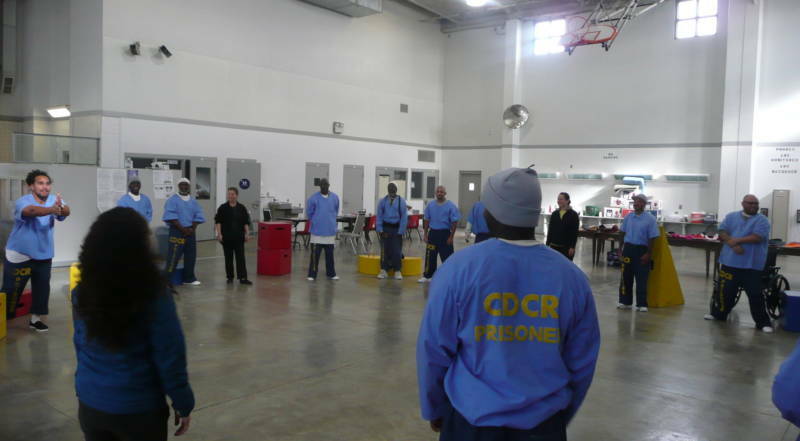 Today the prisoners are starting off with a warm-up exercise called slap pass -- a game that gets them to focus intently on their surroundings. (Don't worry, it's a clapping game; no one is actually getting slapped!) At first, the inmates clap sheepishly, but by the end they’re boisterous and laughing. 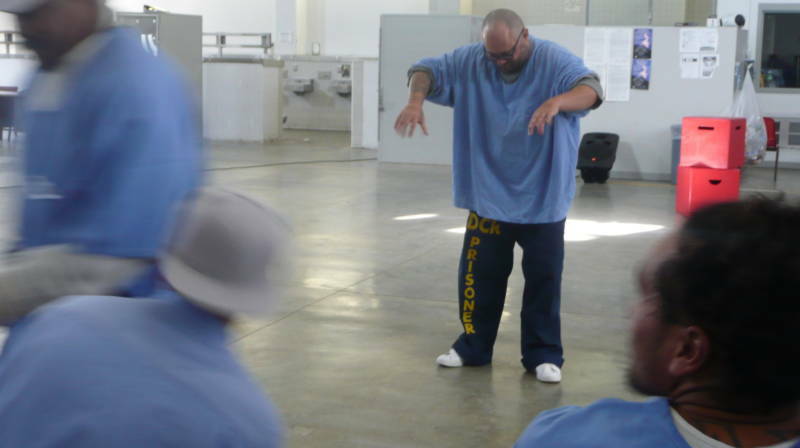 Throughout the class, inmates participate in several other unscripted improvisation games designed to release their creative selves. Pantomiming exercises are big. Prisoners take turns pretending to hit baseballs or play basketball. In another game they imitate a morning bathroom routine using imaginary objects. The inmates develop these skills over time, and by the end of the 12-week course, they will have written and performed an original play. Faavesr says he’s learned to trust more in other people and make better decisions in the heat of the moment. Red Ladder's Altree Piemme says there are exactly the results Red Ladder wants the prisoners to get out of the class. “When their creativity is handed back to them it opens up a whole new world to them," Altree Piemme says. "And it gives them their selves back, gives them their humanity back,"